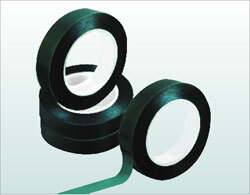 Green Poly Tape is constructed with 2mil Polyester Film and coated with 1.6mil of non-residue pure silicone adhesive. It can withstand exposure to temperature up to 392 ºF (200 ºC) for 30 minutes. It’s designed for general purpose powder coating application, masking of materials subject to high temperature, masking adhesive seams in metal bonding process, splicing siliconized paper/film /non-woven material in converting, and bond photographic film to leader card during processing in automated equipment.